It was ethnic cleansing before there was such a term. During the Stalinist era, most of the ethnic Kalmyks who had not died of starvation during the period of forced collectivization were exiled to Siberia, half of whom perished while in transit. It was decades ago, yet the pain lingers on for the Kalmyk diaspora. 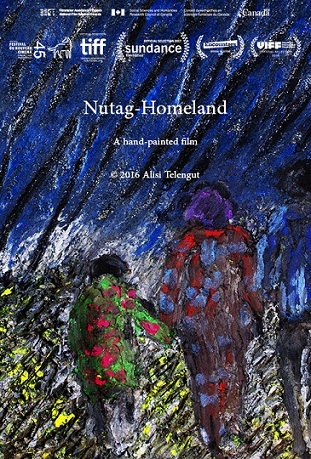 Mongolian-Canadian animator Alisi Telengut gives voice to that pain in the hand-painted expressionistic animated short film Nutag – Homeland (trailer here), which screens during the 2017 Fantasia International Film Festival. Telengut eschews narration, simply letting her arresting images wash over viewers. Technically, she takes a somewhat abstract approach, but there is no mistaking the significance of those trains. The effect is poetic and haunting. Originally, Telengut (whose first name ironically means “far away”) set out to make a traditional documentary, but her imagery and the ghostly music and sound design just took over. Frankly, there is still a need for a straight-forward telling of their story, but Telengut expresses the essence of the Kalmyk deportations, doing right by her subjects, ethically and artistically. Indeed, there is a great deal left to say about the Kalmyk people and their history. For instance, when Khrushchev finally allowed them to return to their homeland, Kalmykia became the only majority-Buddhist political jurisdiction in Europe. At least Telengut has started the dialogue, having previously screened Nutag at high profile festivals, including Cannes and Sundance. It is a beautiful and terrifying work of art. Very highly recommended, Nutag – Homeland screens tonight (7/22) as part of a program of Quebecois short films at this year’s Fantasia.